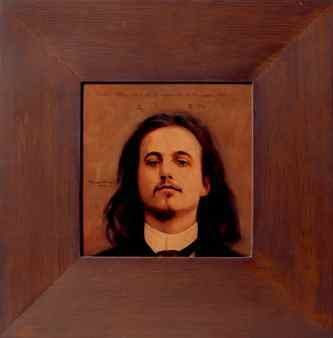 Since I was a kid I've run across this mysterious portrait of Alfred Jarry whenever I've visited the Philadelphia Museum of Art. The painting was made long after Jarry's death by Thomas Chimes (1921 - 2009), a somewhat mysterious figure who studied at the Art Students League, then abandoned New York to spend his life painting in Philadelphia. The picture always discombobulated me. Why make a portrait of a dead man? And why did it hang for so many years there without explanation. Several weeks ago I encountered more of Chimes' work on a visit to the Delaware Art Museum. These, which consist of faded images made from scraping away at layer after layer of white paint, are just as mysterious, but in a completely different day. Apparently Chimes was a master of self-reinvention, the one constant being his interest in certain writers and artists, who he depicted or paid tribute to in a variety of styles. Even though I've "known" him since I was a kid because of that mysterious Jarry painting, I'm only now learning about what I've missed.